Alfaparf is an Italian brand and my hair dressers Introduced me to there products, this is my first time ever purchasing an Alfaparf product. My hair dresser had always used this oil on my hair and the smell is amazing, it’s the reason I bought it. So let’s get down to the benefits, gives your hair instant gloss, protects against humidity and harsh external agents that leave the hair dull and brittle. Hair looks, feels and smells amazing. It also reduces blow dry time. After washing your hair you apply a small amount to your hair before brushing, this also helps to reduce knots. Now I haven’t got a clue of it helps reduce blow dry time, as I don’t blow dry my hair. I have naturally curly hair, I wear it curly well except when the hair dresser straightens it. Curly hair needs hydration, I find using an oil after washing gives it an extra boost. I did notice a difference in my hair when using this, my hair was more glossy and silkier also did I mention the smell. I’ve also used it between washes, to give my hair a bit of shine, help with frizz and to freshen up my curls. The main question will I buy again, yes I will be buying it next time I’m in the hairdressers. Price point for 50ml, its priced at €19.95 and it lasts ages Click here to buy. I love beauty advent calendars, I look forward to opening them every year. It’s so much fun getting a little present everyday. This calendar looks so pretty, I think it’s there first year doing a beauty advent calendar. It was £99 so I think it was about €120 which is expensive but it looks amazing. I got this calendar last year and I loved it, now I can help but compare it to last year and I was a little disappointed by the packaging. It’s priced at €75 and worth €300 Click here to buy . I was not disappointed at all by this calendar, HD brow Colour Pro Palette. I got this calendar as a present. I have to say I’m very excited to try this out, as all the products are free from parabens and sulphates. This calendar also smells amazing. I have naturally curly hair just in case you didn’t know this. Over the last seven month’s my hair has been sulfate free. What are sulfates otherwise known as Sodium Lauryl Sulfate (SLS) or Sodium Laureth Sulfate (SLES) , don’t worry I hadn’t a clue either till I found out about the curly hair method and that Sulfate is not good for curly hair and even worse it’s in most Shampoos and Conditioners. So Sulfate is basically the foaming agent that makes the suds in our shampoo and it is a surface-active agent which reduces the tension of water so this helps your shampoo loosen the grease and sebum from your hair and scalp which all sounds good to me but then when you think about it, it’s just a detergent for your hair and do I really to use a detergent in my hair. Sulfates does help clean your hair but they are also strip your hair of natural oils. Which in curly hair you need those natural oils to hydrate your hair so sulfates are stripping your curls of the moisture they need. Ladies who colour their hair and spend a fortune in the hairdressers like myself sulfate fades the colour of your hair. The first difference when using a sulfate free shampoo is the suds, you do miss them and it takes a while to get use to no suds and you do wonder if you are really giving your hair a good wash but don’t worry you are. I have no noticed a difference since going sulfate free my hair is curlier healthier and my colour lasts longer. My hairdresser has also noticed a difference she said it was less frizzy which is a big thing for me. Read the labels of your shampoo and conditioner before using them and check if they have sulfate. At the moment I am using Shea moisture Shampoo and Conditioner I picked these up in boots and they are €14.99 each so wait till they are on three for two. 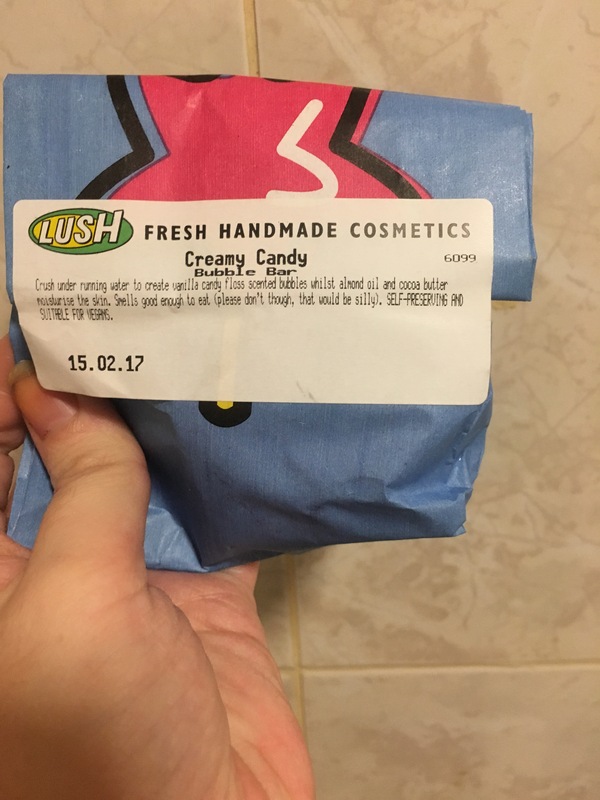 I am going to do a full review but at the moment I am not sure if I will re-purchase this one or try something new. I love baths and after a stressful day having a bath is the perfect day to relax. On my way home from work after a very busy day I headed into lush, it really is one of my favourite shops and the staff are always so nice. 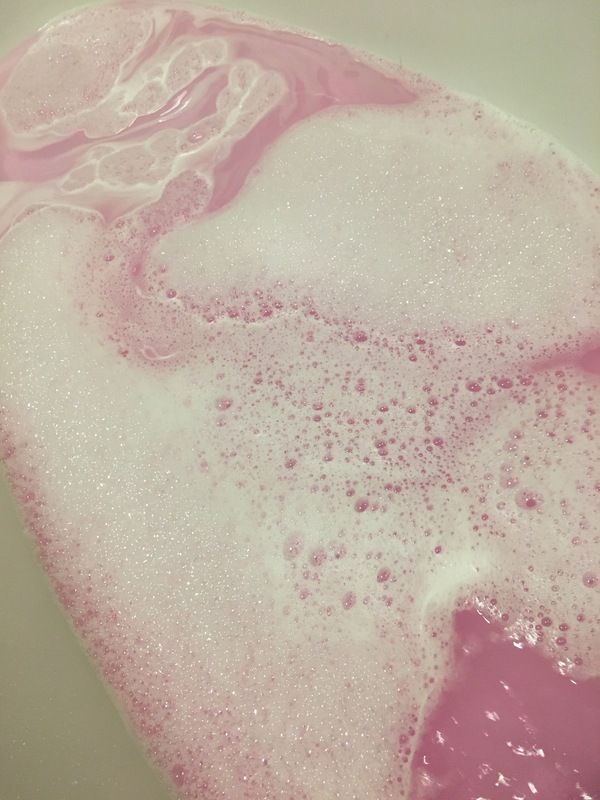 Now I knew I wanted a bubble bar as I love bubbles in my bath . 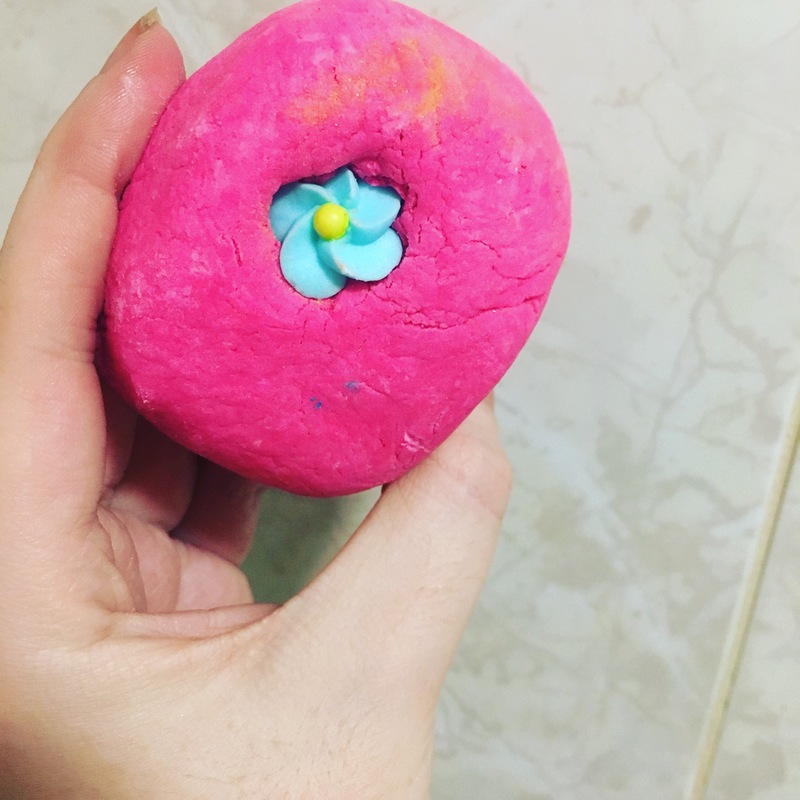 I was drawn to this bright pink bubble bar with a pretty blue flower in the middle. 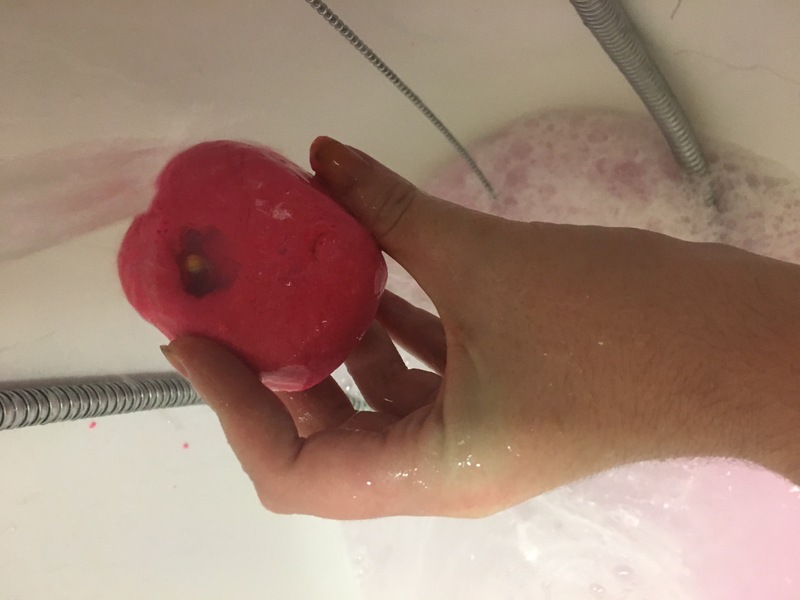 This bubble bar is one my new favourites it was relaxing and I loved the bubbles, it was so relaxing and will be repurchasing.